Saltwater tanks, like freshwater tanks require routine aquarium water tests to ensure life is as safe as possible for your saltwater fish as well as all other types of marine fish you’ve got living in your tiny ecosystem. 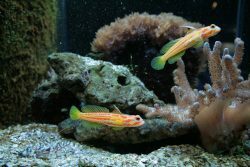 Like anything else in the world, the saltwater fish tank is susceptible to unique types of pollution and toxins that need to be monitored and handled appropriately. 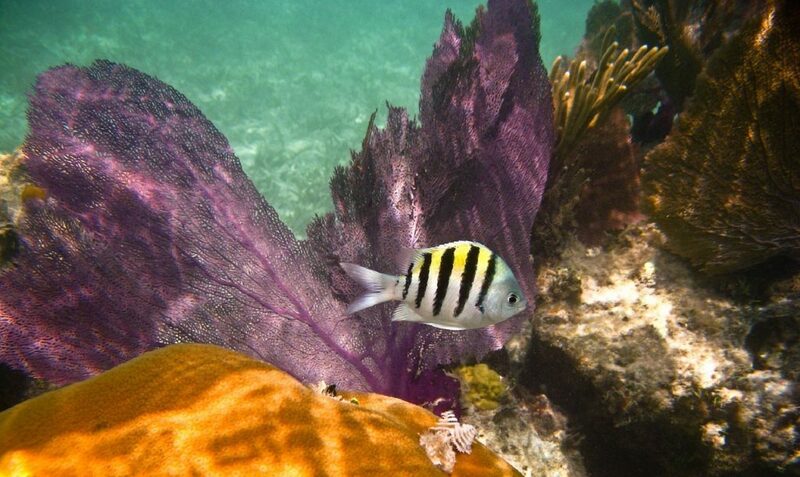 There are several parameters that make up what a safe environment is for saltwater marine fish. 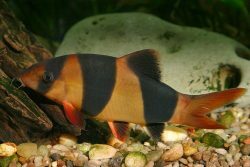 Some overlap with freshwater tanks, but there are some that is unique to a saltwater environment. Like a freshwater tank, you’ll want to perform routine fish tank water tests on nitrate, nitrite, pH, ammonia, and alkalinity levels. These continue to be an incredibly important part of ensuring the health vitality of your fish tank water and the marine life living there. However, there are a few other parameters that also need to be monitored to ensure the health of the tank. That includes phosphate levels, salinity, and a steady temperature. An ideal alkalinity level is between 8 and 12 dkh. A safe ammonia level is 0ppm, as well as for calcium levels, nitrite, and nitrate. Phosphates can sit anywhere under .2ppm, the pH should be between 8.1 and 8.4. Salinity should be at about 1.025 and the temperature should be maintained at 78 degrees Fahrenheit for tropical saltwater fish. 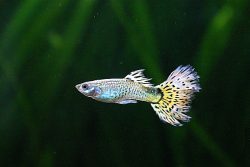 Coldwater fish will require colder temperatures, usually under 68 degrees Fahrenheit but more typically around 60 F.
Obviously these are levels that cannot be measured with the naked eye but with saltwater aquarium water test kits that are designed to not only pick up these values but give you steps to ensure these values are maintained and/or how to apply a fix if something in your tank is off balance. 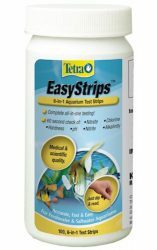 The tests can range from full aquarium saltwater water test kits to aquarium test strips. Your level of familiarity with these tests and your history as a fish own will decide which test is going to work best for you. Below are four options for saltwater and reef test kits that range from beginner help to veteran, do-it-yourself. This is a great test kit for beginners as it comes with almost 600 tests you can perform. It includes a laminated color card for reference, 4 test tubes, and a holding tray for stability while performing the test. There is also an instruction booklet for the tests and what to do when your waters have anomalies that need to be addressed. This kit is ideal for looking at levels for pH, ammonia, nitrite, and nitrate. The results are quick and easy and produce the most accurate results you can get. There is also a test for nitrogen cycles in the water. This is a great starter kit for anyone in need of a place to begin when it comes to testing the health levels of their fish tank. This is now without some drawbacks, however. This test works excellent for pH and nitrite but has been known to be a bit more difficult to get a perfect reading for ammonia and nitrate. It also does not test salinity or alkaline levels. Like the above kit, this one is also great for beginners looking for something to help them along in the testing process. In addition to testing pH, nitrite, nitrate, and ammonia levels, it also tests general hardness, iron levels, phosphate levels, and KH. This gives it a bit more of a well rounded, overall test spectrum for the health of your marine fish in your tank. This aquarium water test kit is good for both saltwater and freshwater fish with ten test parameters. It also helps to monitor the health and life of plants, crustaceans and any corals you have living in the water as well. It includes 5 glass test tubes with caps for mobility, if needed, as well as 1 spoon, 2 pipettes, and 4 instruction booklets. 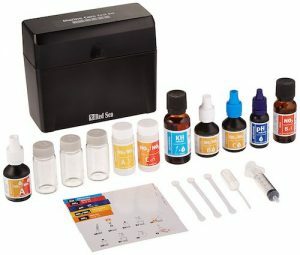 That makes this another aquarium test kit that’s great for beginners (and experience aquarists) who need a bit of guidance while testing water for the first time. Some things to keep in mind with this test kit is that the testing could take a bit of time, sometimes up to 15 minutes for the color to completely chaneg to a final reading. While this may not be a concern for you while testing the chemical levels in your water, it could be a bit aggravating to wait for a reading if you are in a rush. Further, the colors are slightly harder to read, so you’ll want to keep an eye out and train yourself to make sure your reading is as accurate as possible. 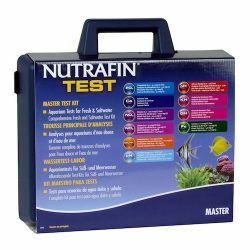 This is a great kit that includes tests for pH, ammonia, nitrite, nitrate, and other basic tests need to ensure the safety and healthy of marine life living in your saltwater fish tank. It includes color charts, simple instructions, and tests with an accuracy level of .02ppm. A great kit for beginners, this has almost everything you’ll need to run good, non-compromised tests on the health and toxicity levels of your saltwater fish tank. This specifically looks for biological toxins as well that can sometimes come from the waste of the marine fish and plant life living in the saltwater or freshwater tanks. 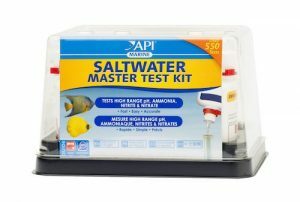 Like many of the other fish tank saltwater test kits on this list, however, it does not specifically test the salinity of the water, though it does take care of a lot of the other tests that are needed. Another problem that can arise is that, while there are instructions, it can be a bit tricky to understand and follow the first time, so you’ll want to do your research on that front. This is the mentioned test strips that lack the bells and whistles but simply work as a dip and watch for results style test.. The water reaction time for these aquarium water test strips is promised to be a quick 60 seconds tops and it tests for chlorine, nitrite, nitrate, hardness, alkalinity, and pH levels. This kit also promises to prevent over development of readings to ensure the most accurate results in 60 seconds or less. These are good for quick readings, perhaps even once a day if needed. Just dip and read for this 6 in 1 test which comes with a 25 strip count package. This kit does lack in instructions, and is the most user lead testing kit so it’s not for beginners if you are looking for guidance throughout the testing of your water. This tests for the basics but does lack the salinity test that is needed for saltwater. Among test strip tests, however, this is one of the better ones you could use. The quick use of this, is a double edged sword, however. That ease of use can make this product not the best for beginners, who might need to get used to testing and realize when there could be some anomalous results that will require some second opinions or retesting. So if you’re new to the world of fishkeeping, this might not be the first fish tank test kit for you. Aquarium water test kits can be one of the most important and crucial purchases you can make as a fish owner and proper caretaker for your saltwater fish. This is especially true for saltwater fish tanks and the marine fish that live there. The water of this ecosystem is as delicate as the ocean themselves and in need of constant monitoring, that means you’ll want to get yourself the best saltwater aquarium test kit you can possibly get. Among the four options above, hopefully you’ll find one that works to ensure you have the safest home for your fish. Always make sure the home for your fish is a safe and happy one. Please be sure to let us know in the comments which saltwater test kit you use or if you have any questions.